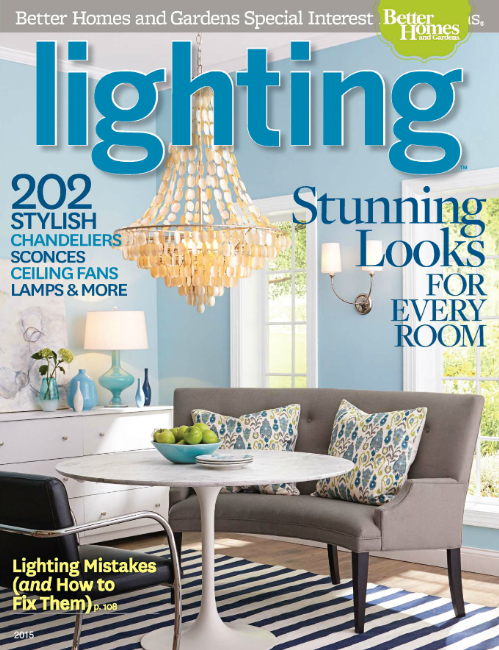 See what’s new in home lighting design and find tips for creating your own stunning spaces in Lighting magazine. Lighting is one of the most important elements in your home’s décor. Before you begin planning your interior space, think about what types of furnishings and lighting you prefer. There are a variety of styles from which to choose: contemporary, traditional, transitional, cottage. With a variety of options, contemporary design is usually scaled down, streamlined or minimalist, with striking and modern lines. Three hallmarks of traditionally styled fixtures are lovely lines, graceful materials and exacting craftsmanship. Between strictly traditional and ultra-contemporary, transitional design has its own classic yet distinctive feel. Merging personal touches with textural materials, cottage style is cozy, imaginative and comfortable. Want to instantly change a room? It does not have to be a difficult task, involve an electrician or cost lots of money. You can make a significant design impact by simply changing out a portable lamp. It really can be just that easy. The illumination itself is already an attention grabber. And, if the fixture is attractive or unusual, it can make a big difference to your space. If you want to make an even bigger splash, replace an old chandelier or add a few colorful pendants to a dark corner or conversation area. Consult with a lighting expert at Hortons Home showroom to get design ideas for your home. We want to add toe-kick lighting below our cabinets and accent lighting above our cabinets. What type of lighting would work best? An effective product to use for toe-kick lighting and lighting above the cabinet is LED tape light. These systems often require discussion with a local lighting associate at a lighting showroom to determine the various parts needed and the type of tape that would work best in your application.